Finally, I'm writing up a review. I thought I'd have one ready after a week, but I've been having trouble getting to use it. But first, let's take a look at what this pretty little thing does. The BellaBeat Leaf is a small-ish wearable tracker. It's quite pretty, if it's your style - a nice leaf motif in silver (actually stainless steel), soft wood nicely complimented by some turquoise highlighting. Really, it's quite decorative and I commend the designers for taking a strong direction on the look and feel of the device - it's a refreshing departure from the usual utilitarian approach of most of the other wearable vendors. The device comes with a chain to wear it as a necklace and a leather strap to attached it to wrists. I opted not to use either of these, however, which I'll get to in a moment. There's no charger because it runs on a coin-cell battery that should last around 6 months. Apparently there's a second necklace on it's way to me along with a small special screwdriver to take the back off the Leaf to change the battery (not sure why it needs a special one). The Leaf is toted mainly as a "women's health" wearable. Both through it's branding and the app itself, it's pretty clear that it's designed with women of child-bearing-capabilities in mind - it offers features such as menstruation and ovulation tracking, for example. But, if you don't menstruate and you like the design, there's no reason that it has to be restricted to that group of people, both of those features are ignorable. And, you probably should ignore both of those features, since the period tracking is done by inputing cycle length and period length - which is fine and dandy if you're like clockwork, which a number of us are not. If you're trying to get pregnant (hell no), or track your regularity, there are many better apps out there for such things, allowing you to input specific dates over time for averages and patterns to be noted. The Leaf's other features are more traditional of that of a wearable. 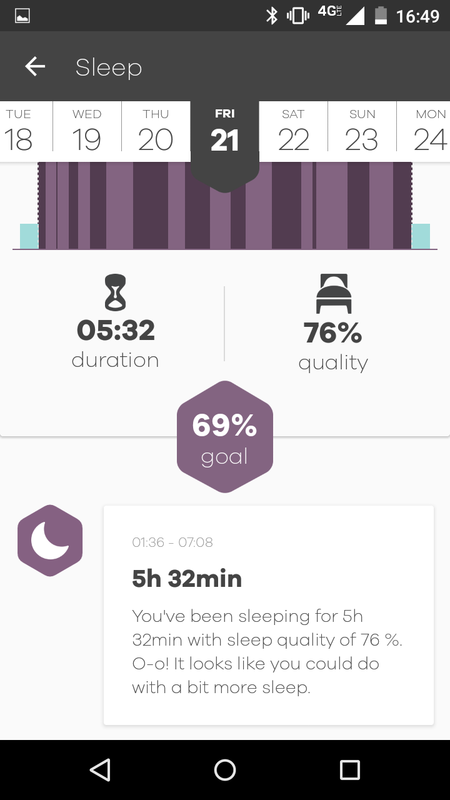 It tracks sleep and activity (steps) along with a slightly odd addition of breathing, meant to help you do something about stress, and it'll alert you to inactivity and has optional additional alarms. I definitely find the step counter is under-reporting compared to the Fitbit Charge, and the sleep tracking is all over the place. I've compared the data for sleep with my Hello Sense and Fitbit Charge and it seems totally off - regularly thinking I've gone to sleep hours after I actually have, and rising earlier than I do. The quality of the data is also a bit lacking - the graphs of sleep data don't allow you to see more than peaks and troughs - no total amount of either deep or light sleep. Additionally, the alarm feature is completely useless. The Leaf's alarm consists of 4 short buzzes over the space of about a second with the ferocity of a dying hummingbird's last breath. Completely ineffective to wake me up on any day. It tracks activity and stress levels in relation to breathing while providing lifestyle data and recommendations for a healthier living through the LEAF app. The stress levels part is basically nonsense. Yes, it tracks your breathing - but only if you go into the breathing section of the app and follow one of the breathing exercises. 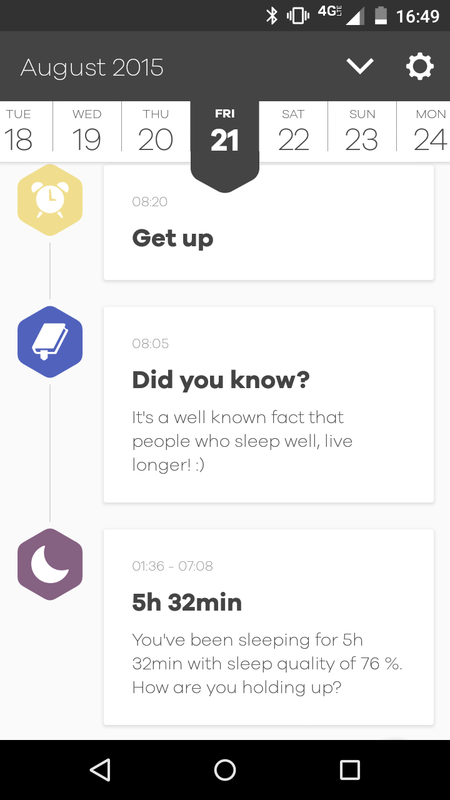 It's not tracking stress levels and then encouraging you to do an exercise - the act of stopping to do a breathing exercise probably would help you to feel less stressed - but you could do that without the Leaf and the Leaf isn't going to try and tell you "Hey, you seem a bit stressed, maybe take a breather?". Quite disappointing. The app is fine, if data light. It feels very much like a work in progress. There's no API yet, but the FAQ suggests there's one in the pipeline. You also can't export any of the data or access it in any way except via the app. The most frustrating thing about the app is it does not do a background sync, so to update your data you have to open the app - and then 9/10 times you need to double tap the Leaf itself to get the sync to begin. That'd be fine except it takes me more than 1 double-tap to get the damn thing to start syncing (which only increases stress levels for me - I hate finicky things like that - plus I look like a mad person repeatedly tapping some part of my body). So, I started this post talking about how I'd had trouble using it. Here comes the real crux of the problem with the Leaf and me: It's a pain to wear. The Leaf is very versatile, you can wear it in a huge number of ways - on your wrist, around your neck, clipped to a collar or trouser pocket - I even clipped it to the side of my bra one day when I had no suitable clothing-edge to attach it to. The fact that I had to find somewhere to wear it every day meant I just didn't bother. The design itself is too much of a statement piece for me, which coupled with the weight (18g - not a ton, but enough to bug) meant I did not want to wear it in a highly visible way, or around my neck or wrist. It's thickness pulls the neckline of dresses and shirts away from my body in a way that I just don't think looks good. Additionally, certain activities require you to move it's position - the breathing exercise must be done with the device clipped against my tummy, sleep tracking had to be attached to my night vest. It's just too much of a hassle. Compare it to my Fitbit Charge with a band that is an innocuous, but functional (thanks to the clock display) that I wear at all times except in the shower, and occasional charging at my desk. It's one position is good for all activities it wants to track. I can just ignore it. Now, the Leaf needs me to take it off for showers (it isn't even water-resistant), clothing changes, bedtime, various activities - I put it down so many times and just forgot I owned it or couldn't be bothered to find a nice way to wear it. Consequently, my data has been spotty at best. It looks like jewellery and I treat it as such - occasional wear when it suits what I'm wearing and a nuisance the rest of the time. If you love the look of the Bellabeat Leaf and would like to wear it as a piece of jewellery only, by all means go ahead and get one. It's not the best tracker out there in terms of data quality, but it's pretty and it might just be the thing for you. If you like the style and you want better data, I'd wait for the next version.